CHENNAI: In yet another important revelation, the Heavy Furnace Oil or bunker oil, which leaked into the sea after a major collision between two vessels, contains as many as nine heavy metals that are non-degradable and can stay in the ocean for decades causing major environmental concerns, besides slowing down the process of bio-remediation of recovered oil sludge. Indian Institute of Technology (IIT) experts, who analysed the samples of the pollutant, have found that it contains zinc, manganese, copper, nickel, lead, cobalt, chromium (total), cadmium and selenium, besides other heavy polyaromatic hydrocarbons and asphaltenes. Indumathi M Nambi, associate professor, Department of Environment and Water Resources Engineering Division, IIT Madras, told Express that bio-remediation can remove the alkanes and lighter aromatic hydrocarbons but the heavier poly-aromatic hydracarbons, heavy metals and asphaltenes are non-biodegradable and remain in the environment for a very long time - even running into decades. They are also the most toxic compared to alkanes. Indumathi, along with her colleague, S Mohan, of the same department and experts from R&D unit of Indian Oil Corporation Ltd (IOCL) have been providing technical expertise for proper collection, transportation and treatment of oily sludge/residue. 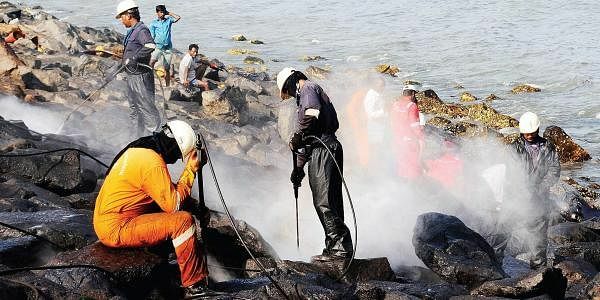 As per latest figures accessed from Indian Coast Guard, 187 tonnes of sludge oil, 109 KL of oil mixed with water and about 81.5 metric tonnes of sand-mixed-oil have been recovered so far and are treated by bio-remediation process with support from IOCL. Pointing to another deficiency in the large-scale bio-remediation process that has been undertaken, Indumathi said the oil sludge is being mixed with clean sand and bio-remediated by adding innoculum IOCL and nutrients. This method increases the volume of the waste which is against the 3R (Reduce Reuse Recycle) concept of hazardous waste management. Moreover, the bio-remediation has to be performed as per the Central Pollution Control Board (CPCB) draft guidelines for oil contaminated sites. It is to be noted that CPCB guidelines were laid for in situ bio-remediation of contaminated sites. For cases such as these, where oil is transported from beaches, bio-remediation should be done ex-situ in concrete tanks. “Ideally, it should have been co-incinerated in a cement plant or it has to be incinerated in a controlled manner in hazardous waste incinerator at Gummidipoondi. Since the oil has already been mixed with clean sand in the port area, some precautions that should be taken with respect to the Chennai site like keeping shallow ground-water table safe from contamination, preventing rainwater runoff and close monitoring of the bio-remediation process by a third party to ensure that the oil is degraded to the maximum extent possible without transferring the pollution to soil, groundwater which eventually flows back to the ocean. Considering the presence of toxic poly-aromatic hydrocarbons in the heavy oil spill, the sea water, beaches, the coast line, fishes, bottom dwelling flora and fauna of sea requires continued long term monitoring,” she opined. The IIT expert also asserts that the oil floating in the sea volatilises and undergoes photocatalytic degradation and increases in viscosity and density over a period of time. Indumathi has also called for continuous sampling of fish, crab and plankton for baseline data on bio-accumulation.